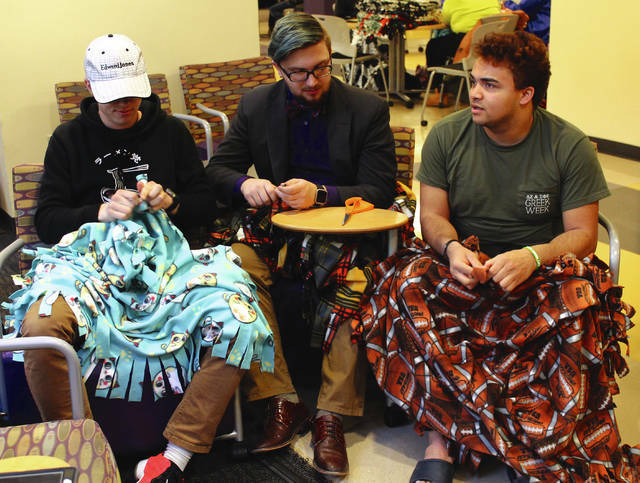 Anna Bolton | Greene County News Wright State University students tied over 500 fleece blankets April 5 for local children in need during a Project Linus Blanket Making Marathon in the Student Union Atrium. Project Linus is a national organization that has delivered over six million blankets to children in need since 1995. Preparation began in September 2017, when students raised $5,000 and cut fabric. 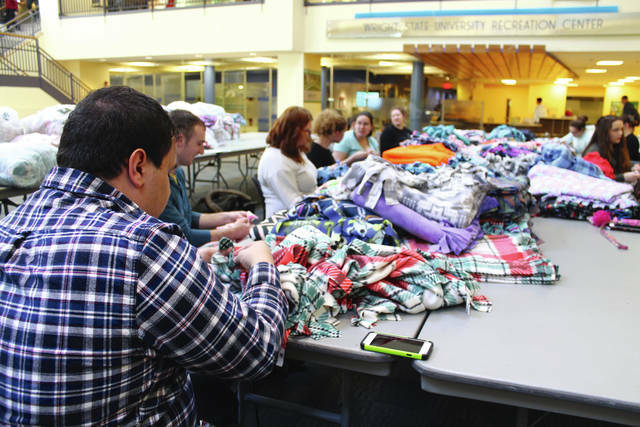 Wright State University students tied over 500 fleece blankets April 5 for local children in need during a Project Linus Blanket Making Marathon in the Student Union Atrium. Project Linus is a national organization that has delivered over six million blankets to children in need since 1995. Preparation began in September 2017, when students raised $5,000 and cut fabric. 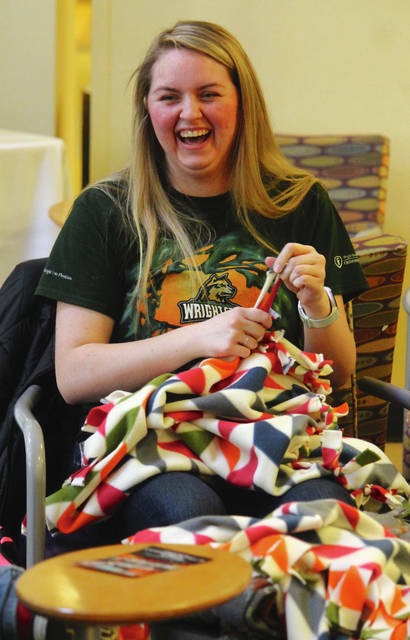 https://www.fairborndailyherald.com/wp-content/uploads/sites/50/2018/04/web1_WSUgirlLaughing.jpgAnna Bolton | Greene County News Wright State University students tied over 500 fleece blankets April 5 for local children in need during a Project Linus Blanket Making Marathon in the Student Union Atrium. Project Linus is a national organization that has delivered over six million blankets to children in need since 1995. Preparation began in September 2017, when students raised $5,000 and cut fabric. https://www.fairborndailyherald.com/wp-content/uploads/sites/50/2018/04/web1_Table.jpgAnna Bolton | Greene County News Wright State University students tied over 500 fleece blankets April 5 for local children in need during a Project Linus Blanket Making Marathon in the Student Union Atrium. Project Linus is a national organization that has delivered over six million blankets to children in need since 1995. Preparation began in September 2017, when students raised $5,000 and cut fabric. https://www.fairborndailyherald.com/wp-content/uploads/sites/50/2018/04/web1_Boys.jpgAnna Bolton | Greene County News Wright State University students tied over 500 fleece blankets April 5 for local children in need during a Project Linus Blanket Making Marathon in the Student Union Atrium. Project Linus is a national organization that has delivered over six million blankets to children in need since 1995. Preparation began in September 2017, when students raised $5,000 and cut fabric. 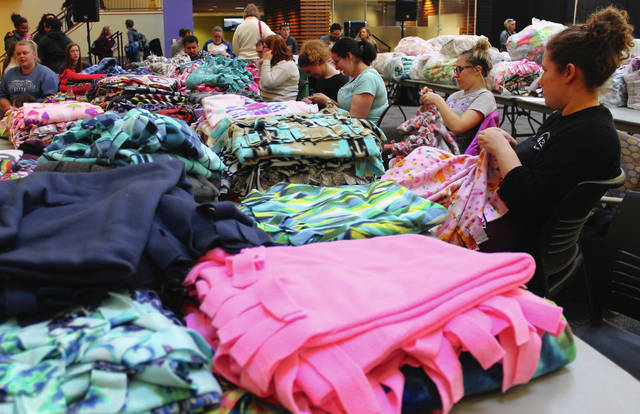 https://www.fairborndailyherald.com/wp-content/uploads/sites/50/2018/04/web1_GirlStage.jpgAnna Bolton | Greene County News Wright State University students tied over 500 fleece blankets April 5 for local children in need during a Project Linus Blanket Making Marathon in the Student Union Atrium. Project Linus is a national organization that has delivered over six million blankets to children in need since 1995. Preparation began in September 2017, when students raised $5,000 and cut fabric. https://www.fairborndailyherald.com/wp-content/uploads/sites/50/2018/04/web1_LongTable.jpgAnna Bolton | Greene County News Wright State University students tied over 500 fleece blankets April 5 for local children in need during a Project Linus Blanket Making Marathon in the Student Union Atrium. Project Linus is a national organization that has delivered over six million blankets to children in need since 1995. Preparation began in September 2017, when students raised $5,000 and cut fabric.